The ITIL – ISO 20000 standard describes all the procedures that must be in place for highly predictable, reliable IT service provision. ITIL is usually referred to as a robust, but complicated standard that requires a lot of training and implementation effort. Regardless of how the ITIL ISO 20000 is viewed, this standard is required in industries where mission critical applications are in place since the standard provides guidance to meet the high expectation of service level provision as described in Service Level Agreements (SLAs). ALM tools for IT Operational support and IT management should be customizable for ITIL. It’s all about effective escalation management. codeBeamer ALM solution can send notifications and take automatic action (via the Tracker workflow) whenever users (via the GUI) and clients (via the remote API) submit and modify issues, or certain events or times are reached. 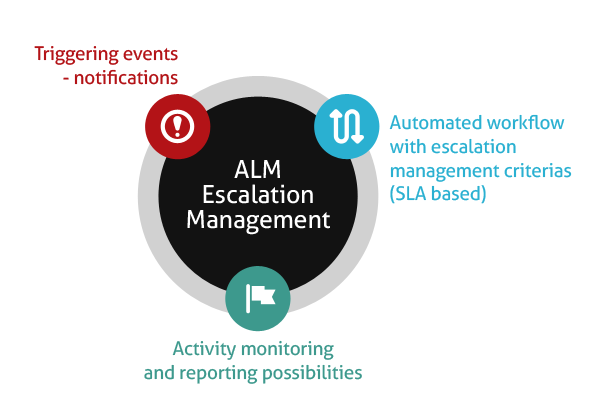 Using Escalation, Trackers can be configured so that issues that meet user-defined escalation criteria, that is issues that need extra attention, can be automatically flagged, so that they can become more visible in a timely fashion. The escalation trigger conditions and resulting actions are user-defined. Escalation processes are constantly monitored and KPIs can be generated by build in plug-ins.